It’s well known that rappers want to be ballers and ballers want to be rappers. 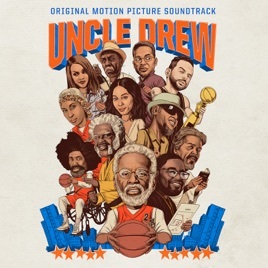 Legends of the microphone converge on the Uncle Drew soundtrack, from the Kyrie Irving soda-ad campaign turned major motion picture. New York—the birthplace of street ball—figures heavily. A$AP Ferg, A$AP Rocky, and Dipset put it down for Harlem with rhymes as timeless as a throwback jersey. Hungry hip-hop rookies GoldLink and Leikeli47 and rising R&B stars Khalid and Nao represent the youth movement. And, wait—is that Irving dropping bars with LunchMoney Lewis on “Ridiculous”? Yes, it is.